Chair of the Mechanical Engineering Technology Program Mike DeVore notes that the approximately 200 majors in his program, as well as an equal number of electro-mechanical engineering technology majors, use the lab’s outdated equipment during three sections each semester. “This lab runs in eternity, day and night” DeVore notes during a tour of the lab. “Thousands of students will be helped by this (donation)”. Cincinnati State’s Lab equipment used by students studying Pneumatics and Fluid Dynamics have been in use for over 20 years by thousands of students and the equipment started to show its age. Hydrotech, Inc., a fluid power & motion automation solutions provider out of Cincinnati, OH along with the leading industry component manufacturer Bosch Rexroth wanted to change this. The solution they came up with was simple. Hydrotech donated four Pneumatic and Fluid Dynamic Training Systems in replacement of the old technology with components from Bosch Rexroth. The four training systems donated were Bosch Rexroth’s DS3 models. The DS3 is a mobile component carrier, which offers two independent workstations. It provides learning topics and experience in the simulation of manually and/or pneumati­cally operated valves, followed by electrically operated valves and the use of a PLC (programmable logic controller) in a control circuit and/or in a pneumatic handling system. This technical knowledge and competence provides students with the decisive advantage in global competition to have confidence and success in their field. Mike Tonyan, Vice President of Hydrotech, Inc. explains how this all came together. “The original request was from Bosch Rexroth’s Learning Center who contacted us. The request was very desirable due to the possibility of a partnership with Cincinnati State’s College and the building of relationships with the students and departmental heads”. When asked why Hydrotech wanted to invest in Cincinnati State's Fluid Power program he stated, “You have to be able to peak and hold young kid’s interest these days. You do that by providing new, cutting-edge technology that not only is top of its class but is aesthetically appealing too. The partnership between Hydrotech, Bosch Rexroth, and Cincinnati State is a perfect example of how giving back to the community and investing in the future of this country through education can have positive effects for generations to come. 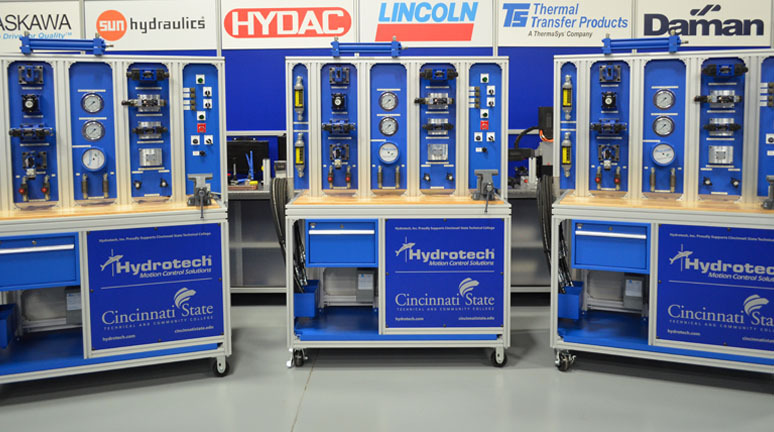 Hydrotech, Inc., a Cincinnati-based fluid power and motion automation solutions provider, has donated four brand-new hydraulic training stands to Cincinnati State Technical and Community College. The training assemblies, valued at $30,000 per unit, will be used by students in Cincinnati State’s Electro-Mechanical Engineering Technologies program. 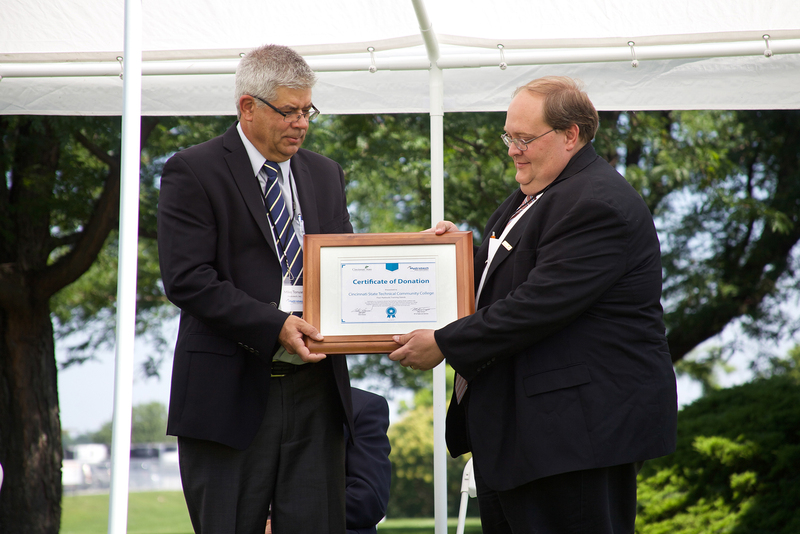 This marks the second major donation of lab equipment by Hydrotech, Inc. to Cincinnati State in the past year. In 2014 the company donated pneumatic training stands to the same program at the College. "These students may be working for us someday or for one of our local clients or partners," said Pete Jones, Hydrotech CEO. "It's a blessing to us that we can help them develop the crucial skills necessary to be successful. 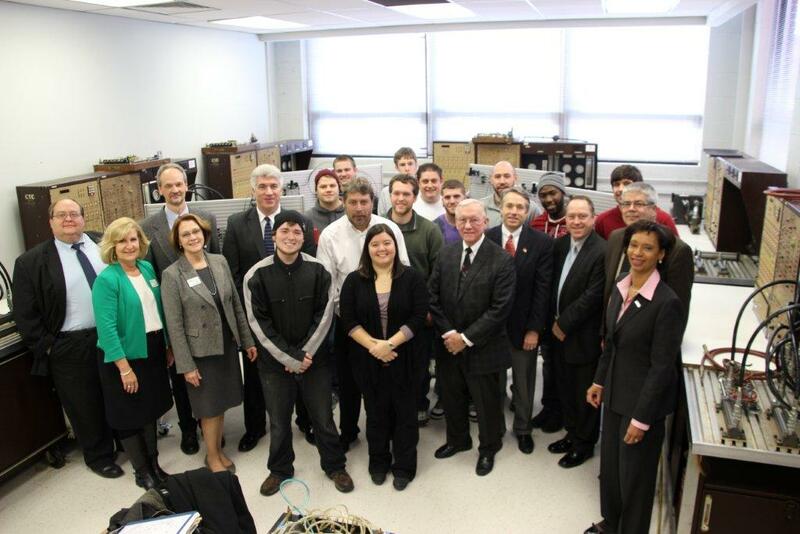 Cincinnati State has a wonderful program that's dedicated to advancing manufacturing in this area. Everyone can benefit from that." More than 75% of manufacturers nationwide report a moderate to severe shortage of skilled resources, according to a 2014 Manufacturing Skills and Training Study conducted by Accenture in conjunction with The Manufacturing Institute. This has encouraged employers to work with colleges and universities to ensure these institutions have not only the necessary curriculum to create employable graduates but also the equipment to simulate today's modern manufacturing environments. "It's like going from an original IBM to an iPhone"
The four hydraulic training stands donated by Hydrotech to Cincinnati State form a system where students can test and train different scenarios they may encounter in the fluid power industry. Between 300 and 350 students will use these stands per year. Cincinnati State's Electro-Mechanical Engineering program trains two-year technicians who will eventually work in field or factory environments, designing components used to produce materials or products. These components are often designed on software and then tested in the factory. 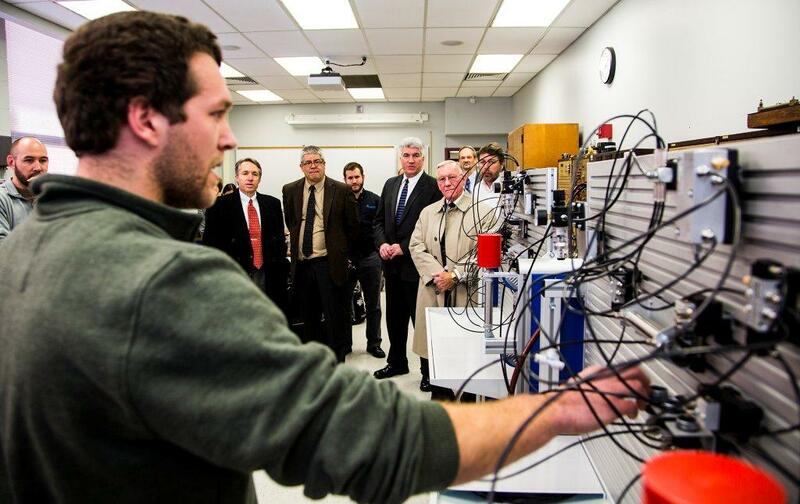 For these students, the hydraulic training stands provide that factory testing without leaving campus. “I let them start on the old equipment, then put them on the new stuff," said Prof. David Simmermon, a Cincinnati State faculty member who uses the lab frequently in his classes. "They can create so many more circuits and have a better understanding of new versus old technology. It's like working on an original IBM personal computer and then switching to an iPhone." Cincinnati State President O’dell M. Owens said the Hydrotech donation is most welcome. It comes at a time when revenue is scarce for capital equipment of this type. Fortunately, Dr. Owens said, Cincinnati State has been able to turn to industry partners such as Hydrotech to keep its labs and programs up to date. For information about Cincinnati State's Electro-Mechanical Engineering Technologies program, please visit www.cincinnatistate.edu/real-world-academics/academics/center-for-innovative-technologies. For more information about Hydrotech and its line of hydraulic training stands, please visit www.hydrotech.com. Cincinnati State (www.cincinnatistate.edu) enrolls about 10,600 students and offers more than 130 associate degree and certificate programs in business technologies, health and public safety, engineering technologies, humanities and sciences and information technologies. Cincinnati State has one of the most comprehensive co-op programs among two-year colleges in the U.S.